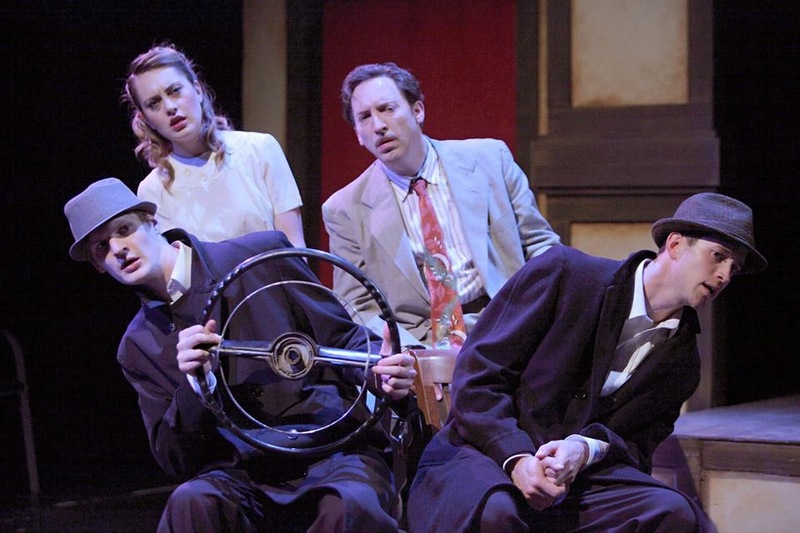 Yellow Tree Theatre concludes their excellent sixth season with the zany British spy thriller comedy The 39 Steps, in which just four actors play dozens of characters and employ many delightful theater tricks to tell a story and entertain. It's another great choice for Yellow Tree's intimate stage, with its small cast, period feel, and fast and funny dialogue. The terrific four-person cast, director Anne Byrd, and the design team have obviously worked hard to make all of the tricks and transitions run smoothly and look effortless. The result is great fun and good old-fashioned theatrical entertainment. The 39 Steps is based on the 1935 Hitchcock movie of the same name, in which Richard Hannay, a bored English gentleman with dark wavy hair, piercing blue eyes, and a pencil mustache, gets involved with a spy and goes on a cross-country adventure to save the world from some unknown evil. And since this is 1935, evil has a German accent. But the details of the plot and the chase really don't matter, it's the fun of the way that the story is told that matters. I've previously seen the show in larger venues (Off-Broadway and the Guthrie), so I was curious to see how a smaller production would handle the tricks of illusion. In some ways the low-tech version is even more fun; we can see the actors manipulating the effects, often with a wink to the audience, which only adds to the entertainment. There's a free-standing spinning door that represents the change of rooms, a puppet show of a plane with crash and burn effects, a car created by a trunk and a few chairs, a chase that requires imagination to follow the actors and their flapping coats to the top of a train, empty frames that create the illusion of windows, and invisible blinds. The scene changes are done quickly, with set pieces rolling on and off stage with remarkable speed. This is one of those shows that would be just as entertaining to watch from backstage. And now a word about the cast, all of whom have been seen on the Yellow Tree stage before. Sean Byrd only plays one character but he does it well - the smooth and charming Richard Hannay. Stephanie Cousins excels at playing three very different woman who each become involved with Richard in different ways. But Nathan Cousins and Tristan Tifft steal the show as the "clowns" who each play dozens of characters of all ages and genders. They're able to create distinct characters not just through a quick wardrobe change, but also through change of voice and physicality. Sometimes they play multiple characters within the same scene, with just a quick spin and a different hat and accent to mark the change. Kudos to Peter Lerohl for designing a flexible set with lots of hidden tricks and to Carolann Winther for the ever-changing costumes that help the actors create the many characters. The whole escapade through city, planes, trains, automobiles, moors, and theater is brilliantly choreographed and flawlessly executed. 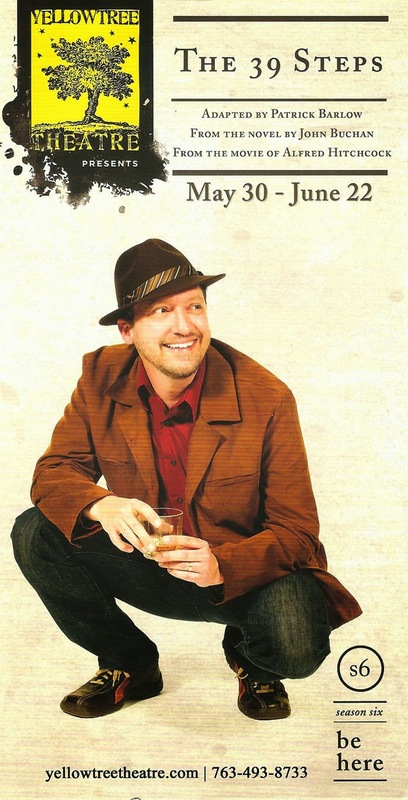 The 39 Steps continues at Yellow Tree Theatre in Osseo through June 22. If you're a Yellow Tree fan I'm sure it's already on your schedule. If not, this is a good time to become one - head out to the suburbs and see what great theater you can find there (discount tickets available on Goldstar.com). And stay tuned for Season 7 which includes a classic play directed by an Ivey Award winner, a new Christmas play by the playwright of Miracle on Christmas Lake, and one of my favorite new musicals of this century.